The degree of freedom enjoyed is the first and the foremost actor in evaluating the health of an individual and society. It is the means and also the supreme end of human well-being. But for ages women have remained subjugated. 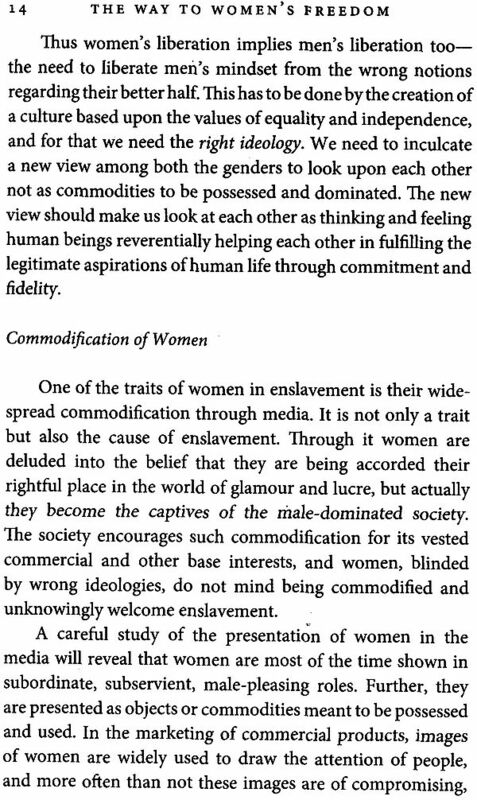 Victims of gender politics from timeless past, today modern women are struggling to break away from their imprisonment. The central issue dealt with in this small book is The Way to Women’ Freedom. Are the modern women truly heading towards freedom? Or are they moving towards another trap? Often what appears to be freedom on the surface proves to be captivity in disguise! What is the true meaning of freedom? What is the way? This is an extraordinarily important issue of modern times with widespread social ramifications. Swami Vivekananda’s views on this matter are crucial. The author carefully presents two contrasting pictures: (1) The present-day woman, her status, and her expression of freedom, and (2) Swami Vivekananda’s view of a truly free woman, and the way to achieve that freedom. For commemorating Swami Vivekananda’s150th birth anniversary, we had brought out a special volume on him in January 2013. The name of the volume is Vivekananda as the Turning point—The Rise of a New Spiritual Wave. 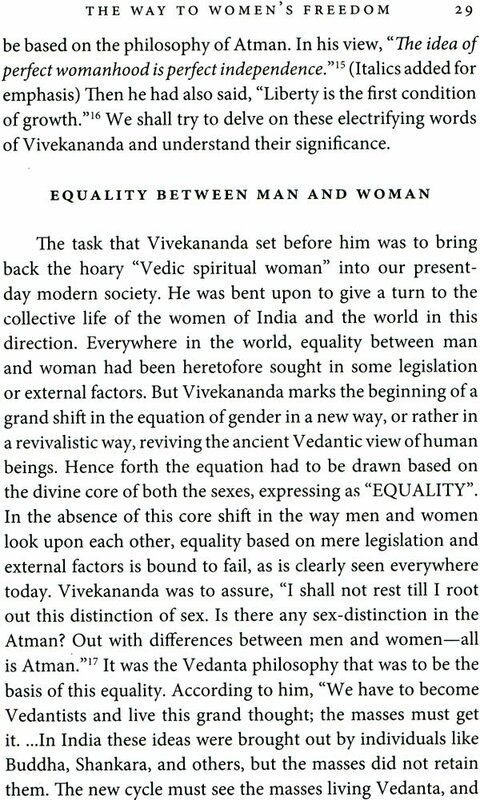 Among the many thoughtful pieces of writings in it, there is one titled “Vivekananda and the Ideal Woman of the Future” by Mrs. Anjana Gangopadhyay. The present booklet is an expanded version of that article with the new title The Way to Women’s Freedom. The first chapter in the book is a fresh addition, whereas the second chapter is a slightly adapter version of the article published in the aforesaid commemorative volume. 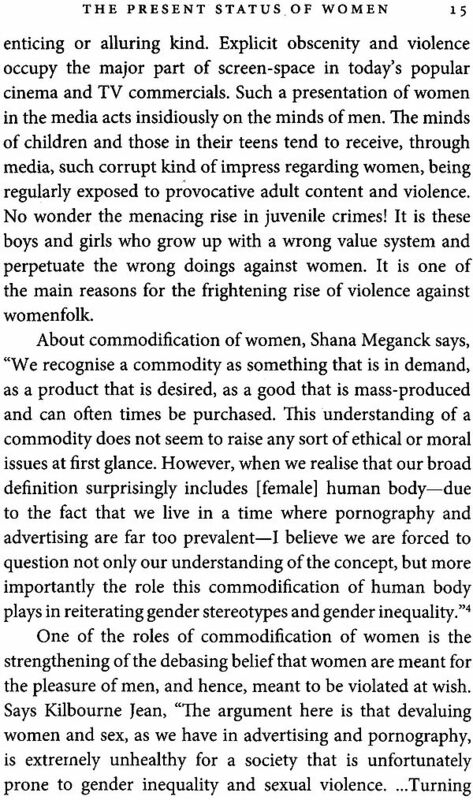 We feel extremely glad to place this work before our readers, especially women. The subject matter discussed here deserves the immediate attention of everyone, and hence we felt the need of bringing out this article as an independent book. Women everywhere have suffered for ages from the disabilities and violations perpetrated by men. This issue has been studied and researched from various angles by scholars and thinkers all over the world. Large numbers of books have been written and there have been opinions of diverging kinds. Swami Vivekananda was one of the great personalities of the nineteenth century who had incisive views on this matter. And modern men and women would be overlooking his view only at their peril. Today our society is changing at breakneck speed, and the resultant confusion in values it has engendered has taken the lives of men and women to the depths of despair. In recent times the crimes against women are seen to have risen to a shocking extent, With all the boasted developments made in the realm of technology and the sophistication it has brought about, human society women are ill-treated, which is inexcusable. What is the status of women? How can their ill-treatment be stopped? How can they attain true freedom? There is an urgent need to review the situation, and for that we need the light coming from higher minds. Swami Vivekananda’s words can instill unbounded strength and courage in the hearts of women who have been struggling to find a way out of their present predicament. 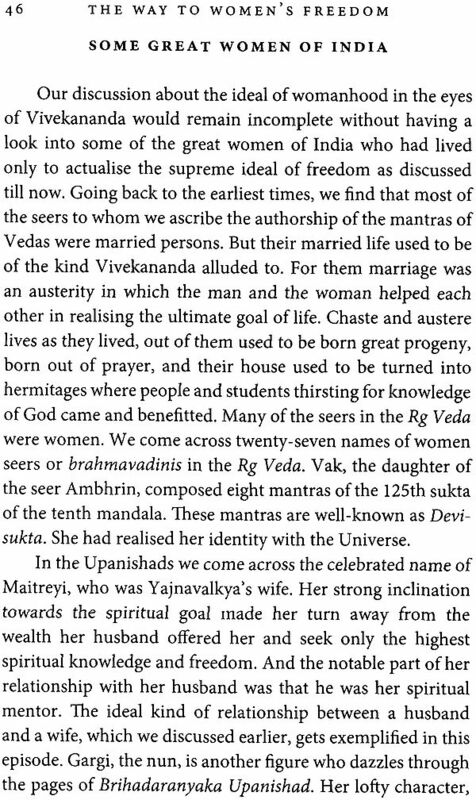 The author has carefully collected the important utterances of Swami Vivekananda and presented them in such manner that a clear picture of the Free, Independent Woman emerges. 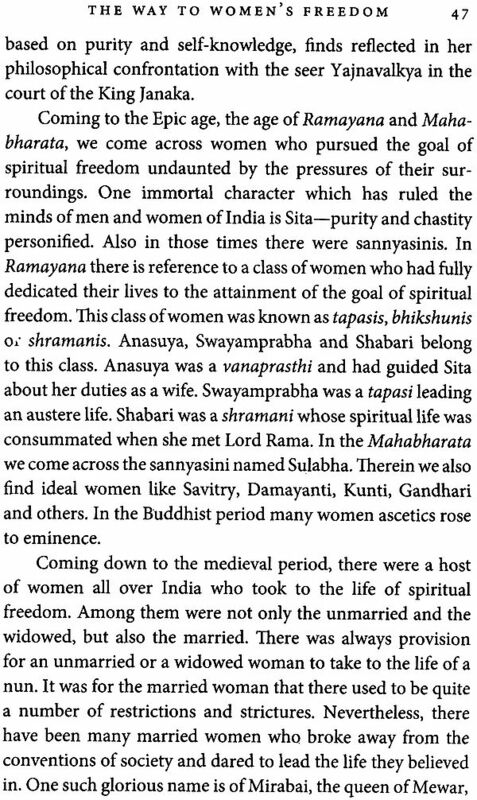 We are grateful to the author for the thoughtful contribution, and are sure it will open the eyes of womenfolk and show them the way to “true freedom” from their present state. The author is a devotee connected with Advaita Ashrama; for many years she has been volunteering her valuable services as proof-reader and for transcribing talks.